I’ve long thought that successful social software requires as much attention to designing for user motivation as it does to implementing those insights in algorithms and clean user interface. I’m not the only one of course who has thought that. It’s an active area of study and commentary. From Jacques Bughin of McKinsey who studied contribution patterns for German video sites to Nick Yee who studied user motivations in MMORPG’s, users come to social sites with and for different objectives. Of course this study leads to detailed recommendations designed to increase contributions – such as recognizing contributors with differential privileges to reputation systems based on contribution ranking. Contribution is only part of the puzzle though. One of the trends that seem to be emerging is the power of weak ties and their role in building social networks and contribution behavior. The first inkling I had of the role of weak ties was Danah Boyd’s misunderstood essay “Viewing America..”. While the essay looked a class differences in FaceBook and MySpace usage, the underlying driver for the difference is friending patterns. As the work of Dr Will Reader – nicely summarized here and here – suggests many of these friendships may be based on acquaintanceship (weak tie) rather than close friendship. The importance of these weak ties in building social sites becomes clear when you examine a diagram from the McKinsey study. 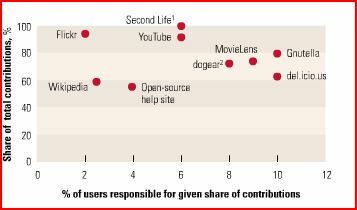 It shows 2% of Flickr’s and 6% of YouTube’s users being responsible for 90+% of their content. Both seem low – and fly in the face of Forrester Study that predicted successful sites have a 13% contribution rate. What’s going on? While I think the McKinsey numbers are partly the result of artifacts from the definition of ‘contributing content’ and ‘user’ the underlying truth is that the type content plays a role in the motivation contributors have. Both sites host content that is far easier to consume than to contribute. I would suggest that part of the reason to contribute is that this disparity enhances the number of weak ties that connect with the content. In other words part of the motivation to contribute is these sites to access users who do not contribute. Some might call this audience – but it’s not so simple because these users contribute to the sites success if the site designers provide (as Flicker and YouTube do) ways for non-contributors to show their approval by rating, voting, commenting and linking/embedding – all of which help establish weak ties between the creator and the consumer. Taken together these studies suggest that the relationship between content contributors, site visitors and content is a complex interplay in which the content is only part of the motivation for a site visit – for both contributors and consumers. It’s an interesting time – as it always is when business models are in flux. You can’t give up on the old model – because it pays the bills – but it’s hard to believe it’s a winning strategy. To make matters worse the new model conflicts with tenants designed to protect the old model. So it is with audience participation and remix culture. You can embrace it, try to stop it – or do a bit of both. danah boyd has just released her speaking notes from her Cannes presentation – “Cinema: The Audiences of Tomorrow”. Really interesting stuff! She outlines the changing cultural and social factors that are driving teens online (towards social software and digital media) and then delves into online profiles and role media / remix play in communicating identity. The motivation is not financial – it’s personal. In most cases all teens gain by remixing is “street cred and kudos”. While she (and I) would argue that this type of engagement should be a marketer’s nirvana. Often it’s not – likely because legally it’s so difficult to discriminate between fans use and use for profit. Partly it’s the result of a legal framework where failure to enforce can be used to broaden permitted uses – and partly it a result a failure of imagination and a fear of not knowing what uses are out there. It may have just gotten easier to track those uses. Erick Schonfeld reviews Attributor – a company that scours the web for fingerprints of any publisher’s content. Even here the role of re-mix as a promotional tool is highlighted – as the software claims to be able to sort out “commercial versus non-commercial uses”. The goal of the company is to allow media to be able to set content free – separating uses that are promotion from uses that are infringement. Erick isn’t so sure that’s how it will be used – and neither am I – but it’s a step in the right direction – as it allows content owners to track use making it possible for them to be more comfortable taking a softer approach to re-mix. We’re to the point where we have to embrace the notion that the duplicability of the content and the ready availability of the content has made it necessary to think creatively about how to market the content. Not an endorsement of re-mix to be sure but recognition is the first step to a new business model and relationship to the audience. Just in time for tomorrow’s teens.